Here's one for you in Ruidoso, New Mexico. 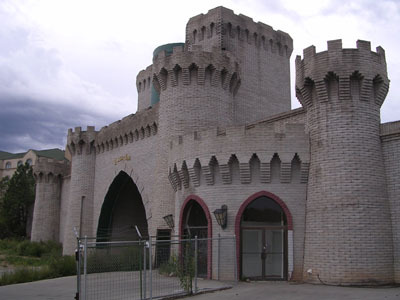 I talked to the owner back in September and he stated that the castle was originally the entrance to a planned community and had a community movie theater as part of the facade. It has numerous rooms and the movie theater area is about 3600 sq. ft. It has also been a local mini stage theater as well as a custom cabinet showroom. Currently he lives in the castle and has added self storage units to the property for income. Follow county road a short ways east to highway 70 & there's your castle with theater. See location on google earth. I recently came across your site and the entry for the castle in Ruidoso, New Mexico. I grew up in Ruidoso, and can recall going to that castle when it was a movie theater (1980s). Specifically, I remember seeing the films "Labrynth" and "Snow White" at this movie theatre. I had friends that lived not far away, and when the theater closed down for good, we would hike over to it and sneak in through the roof. I recall there being lots of film negatives lying around. Later the castle became a community theater, and I actually performed in a play there. After that it closed down and sat stagnant for awhile. Apparently it is a mini-storage site now, as your page relates. I was glad to come across your website because I had always been curious as to why it was erected in the first place. I know that the subdivision on the hill behind it is called "Camelot" so I figured the two were connected in some way. Also, all the streets in that area have names like "Crown" and "Warwick". Photo courtesy of Jeff Clark.